You rock Buzz -- we appreciate folks who aren't satisfied with only intuition. Good luck on the build and please keep us posted on your expoits. Care to post your calculations and such? I am skeptical of this, but open to the possibility if the free body diagrams and math can be provided. As it sits, I can not see how this is possible. Buzz, Rick Cavallaro here. Nicely done! Very few people seem to be able to come back and admit they got it wrong initially. But that's the whole point of this thing. It's a brainteaser. That's literally why I conceived of this vehicle (and later learned that I wasn't the first to have done so). I love the fact that you're going to build one. If you check out my build videos on YouTube (search spork33) you should be able to knock one out pretty quickly. I provide all the part numbers and where to buy them. Please let us know how it goes. Sails make use of the relative velocity between the sail and the air to extract energy. Hence sail-powered vehicles do not move faster than wind. If the first video is an accurate representation of vehicle operation, then it must be that the propellers are doing the work (converting rotational kinetic energy to translational kinetic energy, eventually). But to get the vehicle to start from rest is slightly different from what is shown. There is no free energy since it comes from moving air anyway. Another way to see it is that the machine will never acquire infinite energy, since the air resistance will eventually overcome the driving force. What this machine does is to allow energy conversion/extraction to take place at a higher velocity than the wind speed. The moving air should actually lose energy, but I don't see any way to measure that. That brings us back to the first video, where the air can be regarded as still. So where does the energy come from? My solution: if you regard the air as still, then the treadmill is moving, and it is providing the energy. On the other hand if you regard the treadmill as 'still', then the air must be moving. By Galilean relativity there shouldn't be a difference in these two cases, so we now have two ways of thinking about the problem. Anonymous, that sounds about right, the energy comes from the difference in the speed of the air and the ground (or treadmill). So Galilean transformations to the case with the wind sitting still make analysis of the problem of moving at wind speed clearer. It's still a bit tricky when you try to understand what's going on when it travels FASTER than the wind, though. @Rick, thanks! I was a little grumpy there for a while as I tried to figure it out. But it's very satisfying to see the answer. I'm glad to have heard about it as a result of your vehicle. Thanks also for the information about the parts list -- it will make building one a lot easier. I hope to demonstrate it on our treadmill in the office gym and see what a bunch of physicists think about it. Should be fun! On another note, you should also consider some other things you wrote a few years ago in haste; being wrong about people is no smaller of a deal than getting physics wrong. >The problem with the new vehicle is at least in part the challenge of explaining the physics of the thing. It's easy to calculate; it's just freshman physics. And I occasionally teach freshman physics. Here's something I posted on another doubter's site. Car with wheels and a propellor on top. Car's wheels do not slip on the ground, and their bearings turn with no friction. Propellor is much larger than rest of car, so the interaction with the wind/air is dominated by propellor. Any batteries, motors, or generators mentioned are 100% efficient. I am using motors and generators because they make calculations easy. Gears are hard. I'm gonna start with two trivial examples to warm up, then get to the real deal. 1) Wheels free-spinning. Propellor locked in place. 2) Wheels free-spinning. 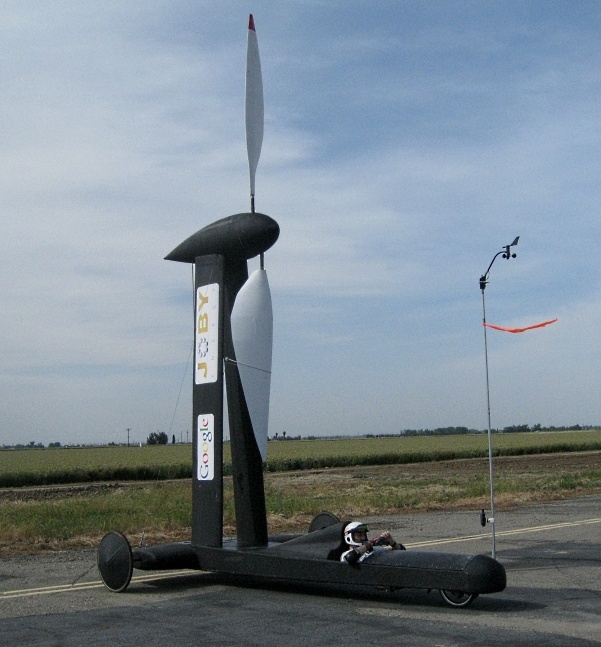 Propellor driven by motor to push against wind, with energy supplied by MAGIC! 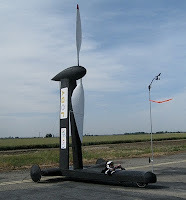 3) Propellor driven by motor to push against wind, with energy supplied by car's battery. Generator connected to wheels to charge car's battery. What's the equilibrium (net power into battery = 0) solution for Vc? Let's work it out! The propellor encounters some mass of wind per unit time dMdt, and changes its velocity by some amount -D.
The resulting force on the car (equal and opposite, and all that) is +D*dMdt. Power = (1/2) * dMdt * ( ((vw-vc)-D)^2 - (vw-vc)^2 ). You should draw yourself a picture to convince yourself my sign convention is correct. Power = force * velocity = D * dMdt * Vc. Holy cow! There's no condition on Vc! You can go as fast as you damn please directly downwind! (In this overidealized frictionless, turbulence-free version). Clearly, to get large velocities, we need L small (pushing the air without stirring it up, for example) and D small - the propellor causes a small change in the air velocity. Examining the limits, we see that at large L (where most of the work we do stirs the air without getting a propelling force) we have the expected limit Vc -> Vw. As L -> 0, we have Vc -> (Vw - D/2) / L.
That's the energy conservation version of directly-downwind-faster-than-the-wind. Counterintuitive? Certainly. C'est la vie.